To help make your trip successful, please note the following information and important contacts. Click here to download the SAPS520 - Completed in BLACK INK. The South African currency is the Rand. Cash and Traveler's Cheques are widely accepted. Most major banks exchange traveler's cheques or cash, ATM's (Automatic Teller Machines) are virtually everywhere for credit card use, and there are Bureau de Change at all airports and major centers. It is important to note that the South African Rand is a fairly volatile currency and the exchange rate tends to change on a daily basis. A valid passport is needed. South Africa requires no Visa. Zimbabwe requires a Visa (approximately $30) that can be purchased at the airport upon arrival. Botswana – It is possible to drive to the hunting areas or you could arrange Flights into Maun Botswana. Cost for driving is $ 1000 return, alternatively flights need to be arranged. Mozambique – Arrival point is Johannesburg from where another flight will be taken to Beira in Mozambique. From Beira you will charter into Camp. Some hospitalization plans do not cover patients in a foreign country. Travellers Emergency Company Network, (800) 275-4836, will transport the injured by plane to a hospital for the necessary care. American Republic Insurance Company (AMERICARE) offers hospital and emergency coverage. Their number is 800-640-9016. Firearm insurance is handled by Hollis E. Boss of Sportsman’s Insurance Agency, Inc. (SIAI) 800-925-7767. They insure guns, bows, cases and related items such as scopes, rings, quivers, sights, etc. Generally speaking, no special vaccinations or inoculations are required coming to South Africa.Medical doctors are within reach in the towns near the hunt area. Although malaria has been controlled in recent years, it is recommended that anti-malaria precautions be commended prior to departure. Please consult your personal physician. Bring all your personal prescription medication with, along with your doctor's contact details in case of an emergency. Tap water is safe to drink throughout most of the country, but if you prefer bottled water, this is readily available. The African sun can be dangerous, so wear a hat and bring good sun block. All your trophies are field prepared (salted and dried) and are included in your trophy fee. The raw trophy skins and skulls will be delivered to your choice of taxidermist or shipping agent to be shipped to the address of your choice. Please note that after delivery to the taxidermist, dipping, shipping, packaging, export documentation, as well as any other charges are the client's responsibility. The dipping and shipping agent or Taxidermist handles export documentation. Because of veterinary restrictions no raw trophy may be exported without being dried and treated. The client will obtain Cites permits, where required, before leaving his country of origin. Your trophies will be marked with your name, part of trophy and address of destination. Clients that opped to have their trophies done and prepared in South Africa will be taken to Highveld Taxidermist in Erasmia, Pretoria. A bolt action or a double rifle is recommended. For Buffalo, Rhino and Elephant—a minimum caliber of 375 or higher is recommended. For Lions, Leopard, Antelopes and other medium game—a caliber of 300 or 30-06 will be sufficient. For dangerous game—40 full metal-jacket cartridges as well as 40 soft-point cartridges are required. For medium game, you will need at least 80 soft-point cartridges. The import of hunting weapons to South Africa and Zimbabwe is free (declaration at customs upon arrival suffices). Botswana have an $ 150 cost per rifle imported and an Ammo tax per round. Mozambique also have an $ 200 per rifle costing. The legislation governing international flights demands that rifles and ammunition be transported in lockable cases with ammunition packed separately. 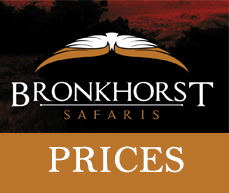 When booking, specify the animals you wish to hunt. All hunters from countries which are signatory to CITES Convention must bring a photocopy or their original CITES permit for Leopard, Elephant, Crocodile, Lion and Hippopotamus. CITES permits can be obtained from the Federal Wildlife Permit Office. CITES Permits is valid for 12 months and could be extended by application. Bow hunting is also welcome. Certain species require special permits which nee to be applies for well in advance. When bringing a video camera or any other electrical appliance, please pack converters for the country you are visiting. You can also buy this adapters at the Airport on arrival. In South Africa we use 3 pronged round hole plugs and some 2 prong round hole plugs. Electric current is 220V and is available in most camps. Lightweight camouflage or khaki clothing, hats or caps, and light comfortable rubber soled ankle high walking boots are essential. Bring a warm jacket as well as clothing that can be worn layered on our cold months. It can be very cold in the morning, warming up to 80F by midday and chilly again in the afternoon. When packing for your trip, please keep in mind that laundry is done on a daily basis. Clients transferring to hunting areas by chartered aircraft should pack minimally. A 50% non refundable deposit of total daily rate is payable upon confirmation of booking. Balance is payable on commencement of safari. Deposit will not be refunded if safari is cancelled. Booking may, with 25% penalty, be switched to an alternative date within the booking year (depending upon availability) or transferred to another person. All payments to be made in US currency or wire transfer. As an extra service we also accept credit cards (with a 5% surcharge). NO CHEQUES or PERSONAL checks are accepted for final payment. Deposits could be done with an cheque. Any Safari activity is potentially hazardous and it is essential that all lawful direction and advice of the Safari operator be followed. 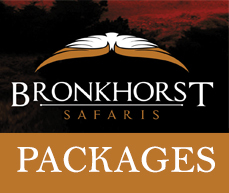 Phillip Bronkhorst Safaris accepts no responsibility for death, injury or illness sustained or suffered by any persons loss, theft, or damage to property occurring during a visit (or visits) to areas or resorts under our control, whether allegedly due to the negligence of any of our servants or agents, or arising from the use of any facility supplied or made available by us.